There are many other islands in southern Japan that seem large enough for B29 runways (the current runway is 2 miles). Why didn't the USA pick the island of least resistance? 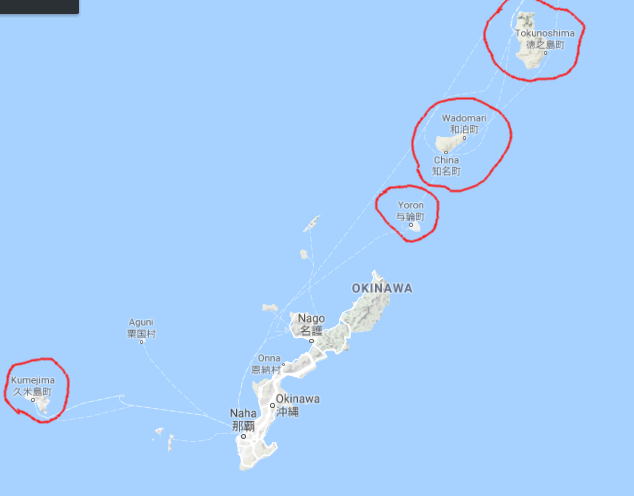 I'd assume Okinawa was the most fortified due to its size and local population. The Allies weren't taking Okinawa for B-29 runways. They had plenty of those in the Mariana Islands. They wanted it as a base for the invasion of Japan, both for ships and shorter-ranged aircraft. Okinawa has harbours, and Kadena Air Base had already been built by the Japanese. This required taking all of the Ryukyu Islands, and that's exactly what was done. The Battle of Okinawa is the famous part of this campaign, because the Japanese concentrated their resistance there, knowing that while they held the main island, the other islands would be of limited use. You can't set up mobile fleet bases while the enemy are still within artillery or small-boat attack range. The other islands in the group were taken comparatively easily, so the combats are not famous. Source: Okinawa, 1945: Final Assault on the Empire, Simon Foster, 1996. Okinawa is the largest (by far) of the Ryukyu Islands. Given the importance of these islands, as discussed in the rest of the answer, this made Okinawa the one to own. That is, Okinawa had room for "runways," harbors, and other facilities, in addition to its strategic importance. A large part of the importance of the Ryuku Islands stems from the fact that it is a chain of islands that more or less link Japan to Taiwan, and points south and west. With the possession of those islands, America could completely cut off the Japanese Home Islands from its possessions in China. Had the atomic bomb not been dropped, the year 1946 might have featured an invasion of Japan simultaneously with the liberation of Japanese held China. From an "invasion" perspective, the Ryukyus generally, and Okinawa particularly, were close enough to the main Japanese islands for both ships and short-ranged aircraft to be a menace to Japan, and yet not so close as to meet the "main force" of the Japanese defense. This made them an ideal target for a "preparatory" invasion in 1945. Not the answer you're looking for? Browse other questions tagged world-war-two or ask your own question. Was the Italian campaign a strategic mistake? Why did Hitler not invade Sweden? Why did the US insist on invading Japan instead of blockading it in WWII? Did the atomic bombing of Hiroshima and Nagasaki contribute to Japan's surrender? Why did the British leave Kohima and Imphal “lightly” defended in 1944? How many times did the US experiment before dropping the atomic bomb in Japan?